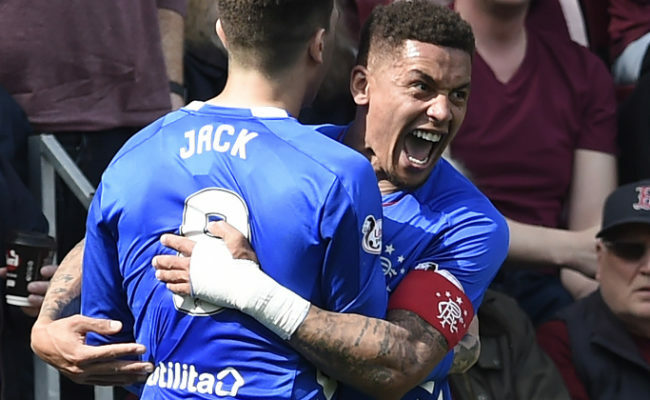 RANGERS closed their gap with Hearts in the Ladbrokes Premiership to five points after a stunning victory over the league leaders at Ibrox Stadium. Following Thursday night’s memorable 3-1 Europa League group stage victory over Rapid Vienna, Steven Gerrard’s men again hit top form against the Jambos and blew the visitors away in a sensational first half with Ryan Kent, Alfredo Morelos and Scott Arfield all finding the net. 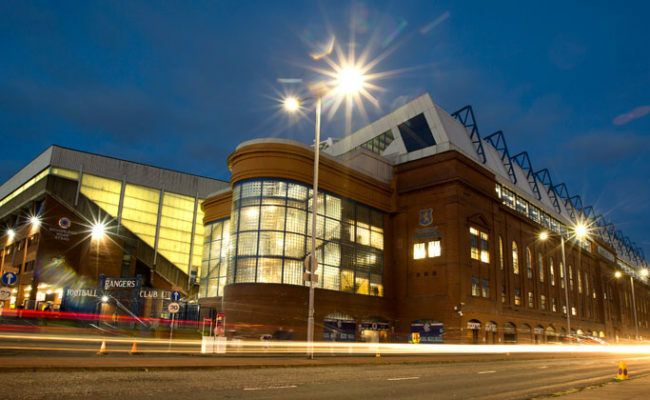 Craig Levein’s players had not tasted defeat in their previous seven league matches before coming to Ibrox, taking 19 points from a possible 21, but they struggled to cope with Rangers’ relentless attacking play in the first forty-five. Hearts went down to ten men before the hour mark when Michael Smith saw red but they showed their battling qualities to pull a goal back through Jimmy Dunne with 67 minutes on the clock. That gave the away support a bit of hope in the latter stages of an entertaining contest but their side couldn’t beat Allan McGregor again and Rangers secured a crucial win they thoroughly deserved before the international break. The pre-match drizzle meant the Ibrox playing surface was quick and slick as the game started at an incredible pace and Rangers got their noses in front after just two minutes of action. From James Tavernier’s free-kick midway inside the visitors’ half, the Hearts players sprinted out in an attempt to play the offside trap but it back fired big time. Uche Ikpeazu looked to be the player who failed to run out with his teammates and the ball landed at the feet of Morelos who, not surprisingly, paused when he realised there were no maroon jerseys near him. With goalkeeper Zdenek Zlamal coming out to narrow the angle the Colombian simply played a five yard pass to the overlapping Kent who rolled it into the empty net in front of an ecstatic Copland Stand. 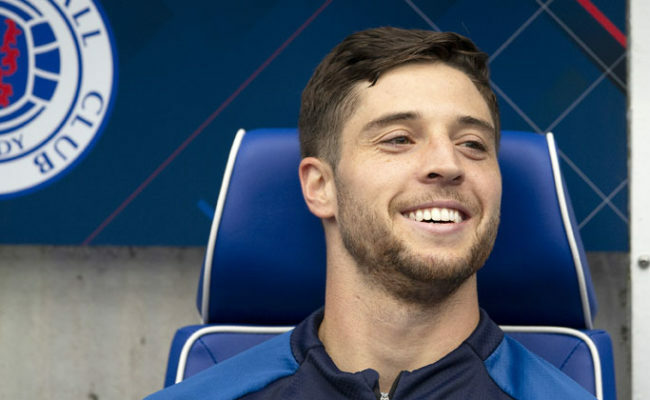 It was a bizarre goal for the Jambos to concede so early in the game but in the next few minutes Rangers had McGregor to thank as he produced two incredible stops. First up the club’s number one denied Steven Naismith with a terrific close-range save after the Scotland forward jinked into the 18-yard box and looked certain to level the score. On six minutes Ikpeazu then powered past Joe Worrall and his left-foot drive again brought out the very best from McGregor as he palmed away the big striker’s netbound effort. The action was relentless in the opening stages with fans unable to catch their breath, and on 13 minutes the rampant Light Blues doubled their advantage with a stunning goal. The industrious Daniel Candeias did brilliantly to dispossess Hearts left back Demetri Mitchell and his low, first-time cross was flicked coolly into the net by Morelos from inside the six-yard box. Once again it was a stunning finish from the in-form Gers striker who grabbed the chance to take his goal tally for the season to eleven. It was proving to be an unbelievable afternoon for Gerrard’s determined side and on 32 minutes it got even better for the Ibrox faithful when their heroes made it 3-0. It all started when Lassana Coulibaly nutmegged Naismith in the centre circle then fed the ball out wide to Tavernier on the right flank. The captain’s deep cross went beyond the back post but Morelos rose to head the ball down across goal. Zlamal could only get a hand to it and Arfield was sharp and alive to prod the ball into the net. 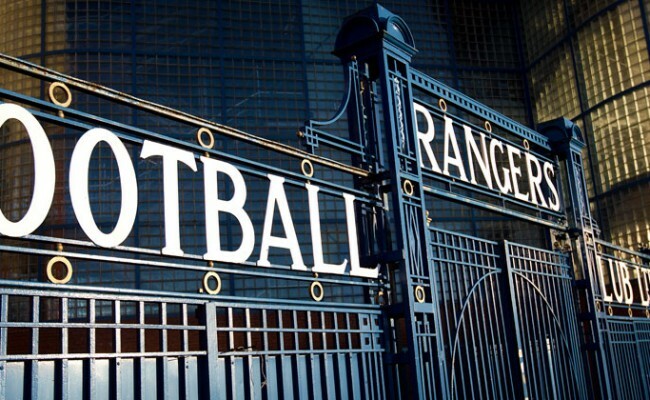 On the pitch Rangers were flying and the four stands were bouncing as the players in blue went in search of a fourth goal, with Coulibaly, Arfield and Ejaria pulling the strings in the engine room and Kent, Candeias and Morelos a constant threat in the last third. Hearts already had a tough job clawing their way back into the match in the second half but on 55 minutes it became a mountain to climb when Michael Smith received a second yellow card for a block on Jon Flanagan as the left-back attempted to get in the Hearts box. That again lifted the vociferous home support and in the next attack the lively Kent slalomed past two of the visitors’ players but his shot from 20 yards was straight at Zlamal. 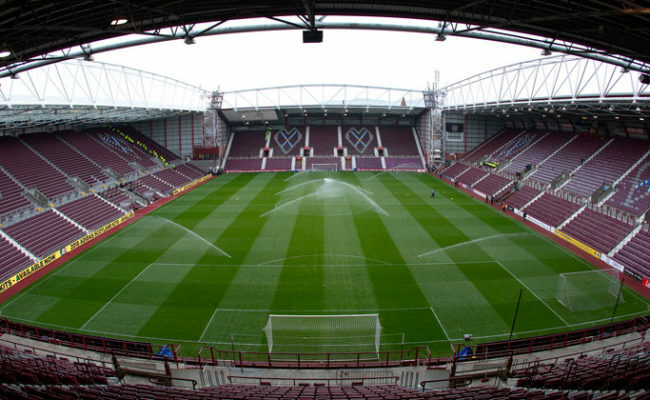 On 66 minutes Gerrard made his first substitution with Ryan Jack replacing Ovie Ejaria, but within a minute Hearts had pulled a goal back with centre half Jimmy Dunne glancing a header low beyond the helpless McGregor after a cross had been put in from the left wing. The goal was a shock for the Rangers fans who had watched their side totally dominate up to that point and it also gave the Hearts players a lift for the remainder of the contest. They couldn’t add a second goal however, with a powerful shot from distance from Arnaud Djoum, which stung McGregor’s hands, the closest they came to beating the Rangers’ number one.